Know the code behind CMS compliance. 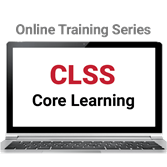 Take the Certified Life Safety Specialist Core Learning Online Training Series -- including vital training on the 2012 edition of NFPA 101®: Life Safety Code®. A must for health care facility managers, this self-guided online training series helps you grasp key concepts in NFPA 101 as they relate to safety challenges in the health care environment. The training furthers your knowledge about the 2012 edition of the Life Safety Code, and facilitates your understanding of CMS compliance as outlined by the Centers for Medicare & Medicaid Services (CMS) adoption of this edition. CMS is surveying to the 2012 edition of NFPA 101, and this new training series covers some of the most important requirements facility managers need to interpret correctly to protect patients and staff. Work at your own pace to gain the type of critical knowledge needed for job success, and help prepare for accreditation programs such as the NFPA® Certified Life Safety Specialist (CLSS-HC) for Health Care Facility Managers program. Anyone concerned with life safety compliance for health care occupancies, including: facility managers, authorities having jurisdiction (AHJs), safety directors, engineers, architects, risk managers, and code consultants. Complete this two-hour course series and qualify for 0.2 CEUs. Completion of each individual one-hour course qualifies you for 0.1 CEU. Upon successful completion of a course or the course series, participants will be prompted to download the CEU certificate directly from the course site.